When you think about incredible castles, you probably think about big stone fortresses. Perhaps you picture elegant palaces and the grand country estates that dot the European countryside. But you probably don’t think about anything you’d find right here in the United States. 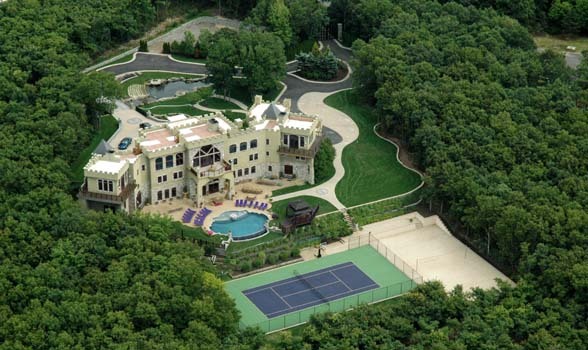 Despite never having a monarchy, or even an official elite ruling class, America has an impressive number of castles. More than 50 in fact! Because the accurate definition of “castle” sounds something like “buildings fortified against attack,” and historically America has not had to worry so much about attack, we’ve included on our list country houses, follies, mansions, and any other building designed to give the appearance of a castle. 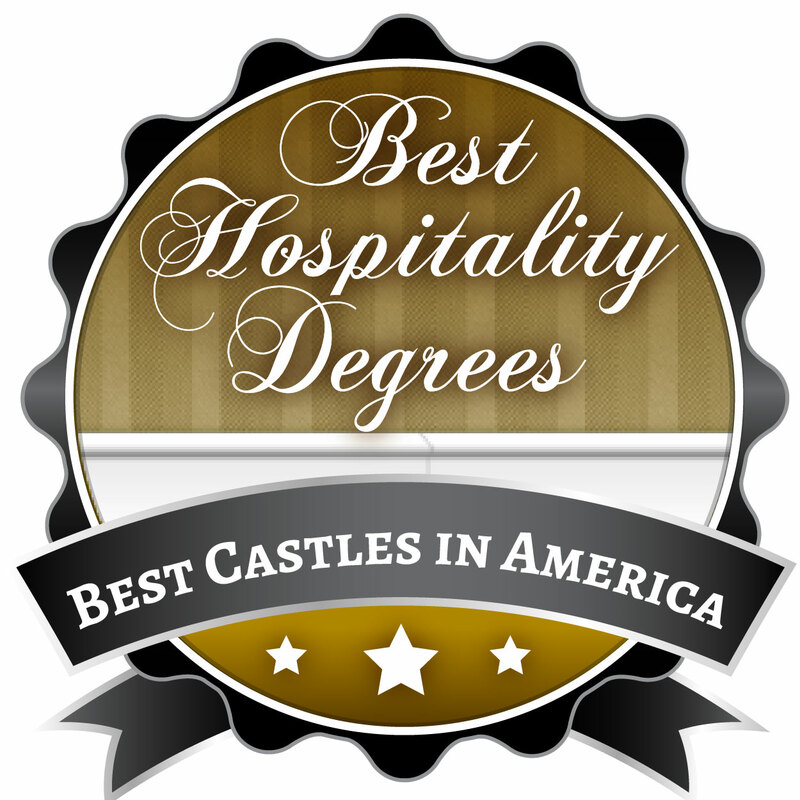 We considered every castle in America, but to narrow down our list to only 30 incredible castles, we considered things like historical significance, overall aesthetic appeal, incredible features, and even how accessible it is to the public. It was a tough task, but we’re sure we’ve done it! 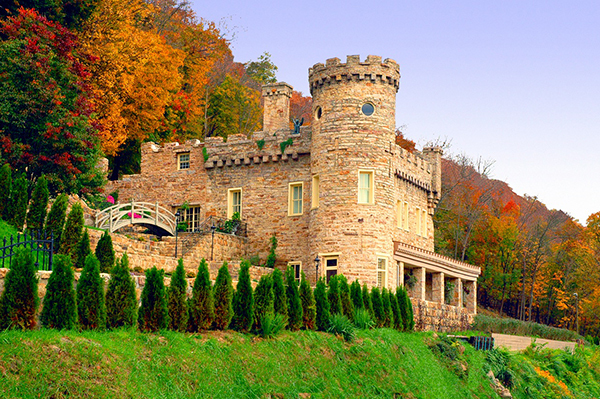 Below are the 30 most incredible castles in America. 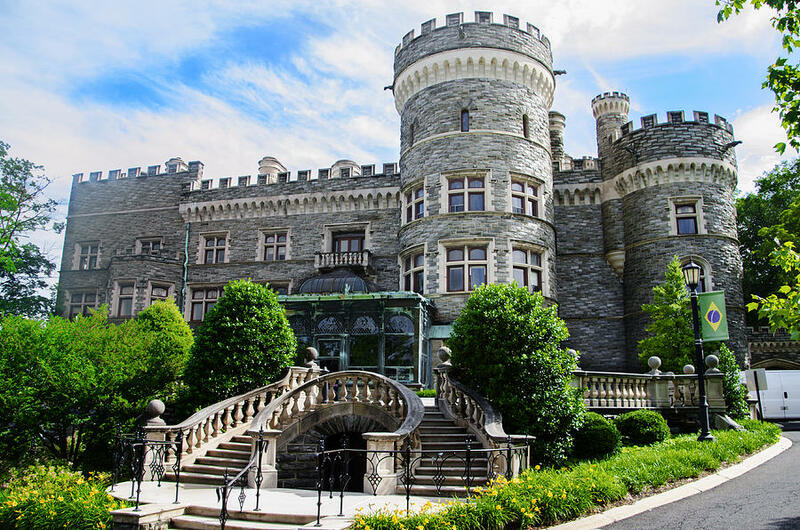 One of the few castles on this list to actually be used as, well, a castle (as opposed to a private residence) is Bannerman Castle in Beacon, New York. Constructed in the early 1900s by Francis Bannerman, a Scottish-American munitions merchant, the castle’s original purpose was as an arsenal. It was designed to look like a Scottish fortress, and includes towers and turrets, a stone wall, and incredible views. 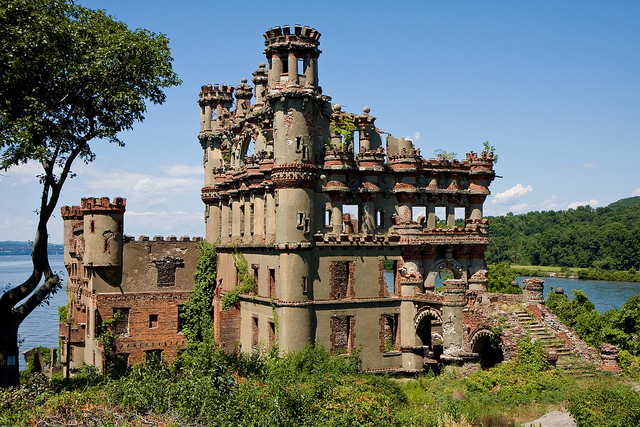 Much of the castle was destroyed by fire in 1969, but the Bannerman Castle Trust offers tours of the castle grounds during the summer, as well as a number of fun special events. 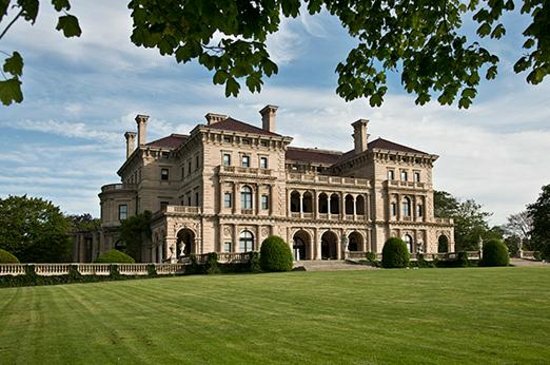 Like its neighbor, The Breakers, Belcourt Castle is located in Newport, Rhode Island, the favored summer destination of the late 19th century rich and famous. Belcourt was built in 1894 for Oliver Hazard Perry Belmont, a socialite and congressman, who used the castle as a “summer cottage.” Belmont’s cottage totals more than 50,000 square feet and 60 rooms, the most incredible of which was inspired by Louis VIII’s Versailles hunting lodge. 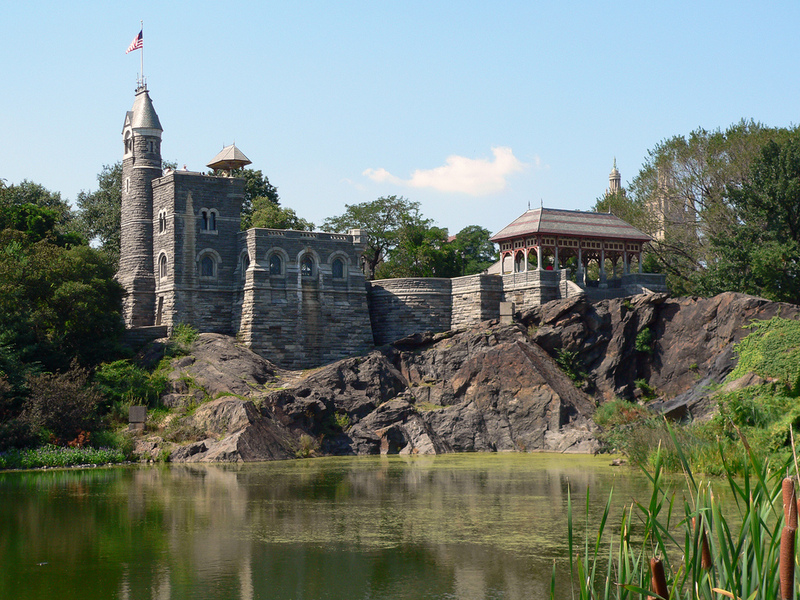 The Tower of London-esque Belvedere Castle was never meant to perform any castle- or palace-related duties, but this purely ornamental fort located in the middle of Central Park is so much a part of the New York character, we just had to include it. The castle includes turrets and other architectural features characteristic of British fortresses. Inside, visitors will find a nature observatory and great views of Central Park’s turtle pond and Delacorte open-air theater. Imagine someone trying to win you over by building you a castle. That’s exactly what Colonel Samuel Taylor Suit did in an attempt to win over the affections of a woman with whom he had recently fallen in love. Colonel Suit did get the girl, but ended up dying before his castle could be completed. And what an incredible castle it is! 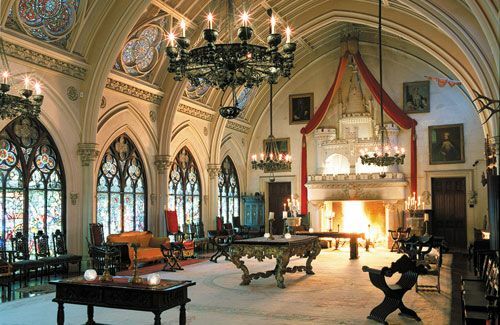 The castle’s 15 rooms include a 40-foot by 50-foot ballroom, plus a number of incredibly impressive original design features. Today, the castle is privately owned, but available to the public for special occasions. When steamboat and railroad tycoon George Vanderbilt visited the gorgeous region of the Blue Ridge Mountains, he became enchanted enough to want to build a home there. But he didn’t build just any home. 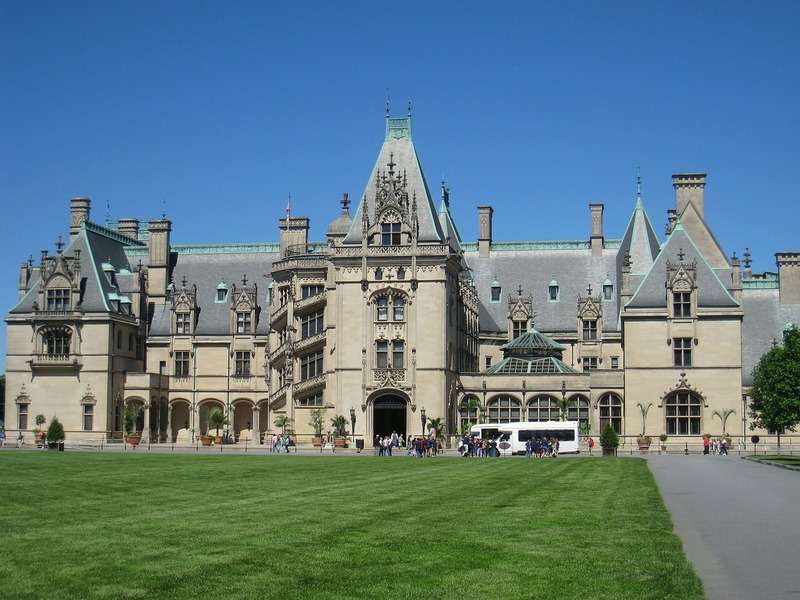 Rather, Vanderbilt commissioned architect Richard Morris Hunt to construct the Biltmore Estate — a 250-room French Renaissance chateau and the largest privately-owned home in the United States. Visitors can take a tour of the chateau to see a good selection of the Biltmore’s grandness, including its 70-foot ceilings, 15-acre Azalea Garden, and some of the vineyards that produce the Biltmore’s award-winning wines. 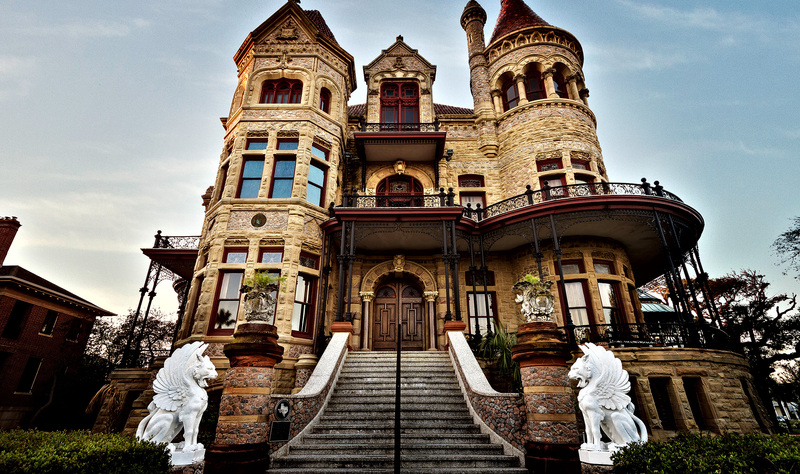 Bishop’s Palace, or Gresham’s House, was built in the late 1800s for Colonel Walter Gresham, a prominent Texas attorney and entrepreneur. Architect Nicholas Clayton built the palace in a Chateau-esque style, so the building features such incredible features as a massive stairwell made entirely of mahogany, myriad stained glass windows, and dozens of decorate wood carvings. 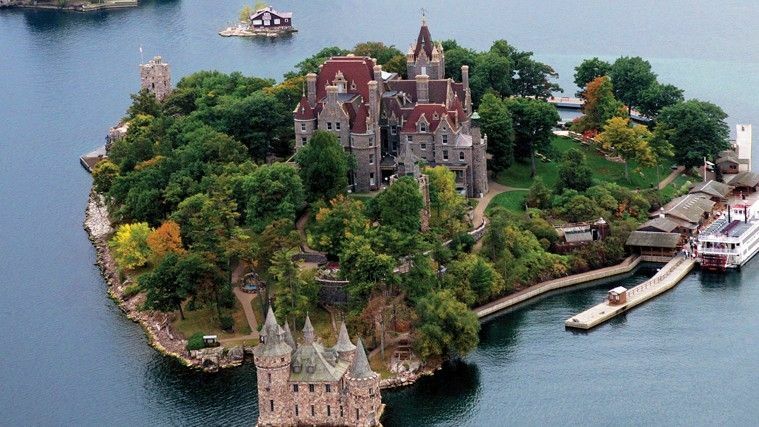 Boldt Castle was built in 1900 as a summer home for hotel magnate George C. Boldt. It’s a Rhineland-inspired stunner located in upstate New York’s Thousand Islands region. Unfortunately, construction of the castle was halted after Boldt’s wife died unexpectedly, at which point it sat unoccupied for more than 70 years. Fortunately, the castle is now owned by the Thousand Islands Bridge Authority, which has restored it to its rightful glory and now gives tours of the beautiful 120-room castle. Like the Biltmore Estate, The Breakers was commissioned by the Vanderbilts and designed by architect Richard Morris Hunt. The design of the 72-room, 125,000-square foot mansion was inspired by the Italian Renaissance, and includes such incredible features as dozens of freestanding columns and myriad relief sculptures by the Austrian-American artist Karl Bitter. Built in 1893, The Breakers is no longer a private residence, and is open to the public for tours. 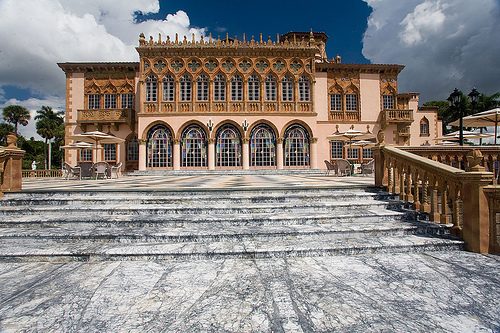 Traditionally, castles were inherited from long lines of noble families, but Florida’s Cà d’Zan is a testament to the American Dream. This grand Mediterranean Revival was the winter home of John Ringling, and includes all of the impressive, larger-than-life features that one might expect from the man behind Ringling Brothers Circus. Visitors won’t want to miss glimpses of the castle’s Spanish barrel tile roof, the incredible waterfront dock, and numerous windows made of Venetian glass, among so many other things. Although the mansion fell into a state of terrible disrepair, it recently underwent a massive restoration during which it was brought back as accurately as possible to its former glory. 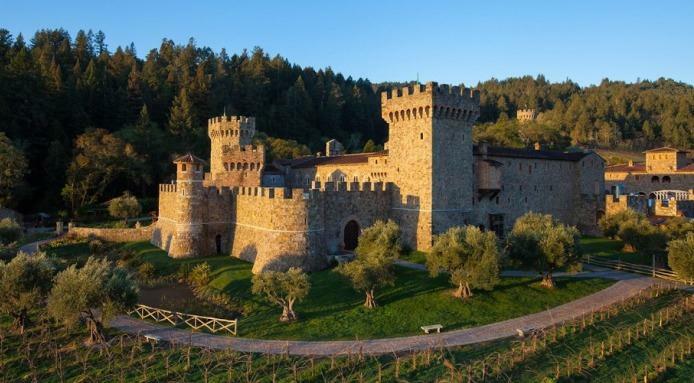 Catch a glimpse of Castello di Amorosa and its 360-degree views of vineyards, and you might think you’re in Tuscany, not the Napa Valley. The castle was built by famed winemaker Dario Sattui, and construction was only completed in 2007. It is made of as many pieces of actual ruined European castles as possible, and was even built using the same methods that would have been used in the 13th century. The castle features 107 rooms (almost all of which are used for winemaking), a traditional Great Hall with Italian-style frescoes, a drawbridge, a dungeon, and even a torture chamber! 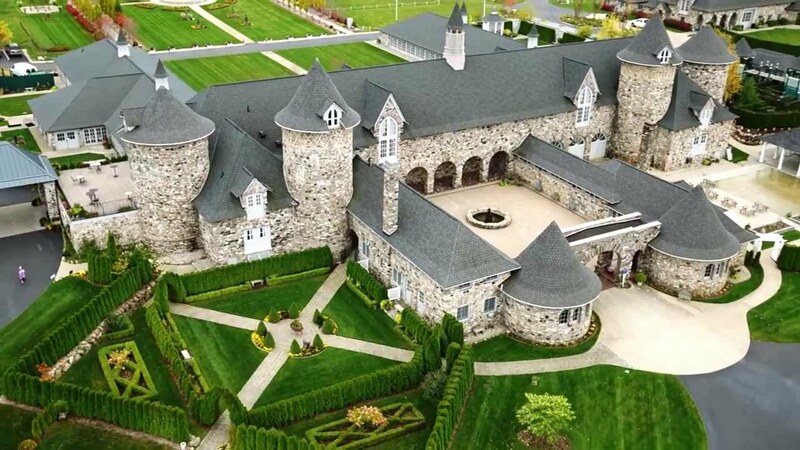 Castle Farms in Charlevoix, Michigan looks like something straight out of pre-Revolutionary France, making it an easy addition to our list of the most incredible castles in North America. 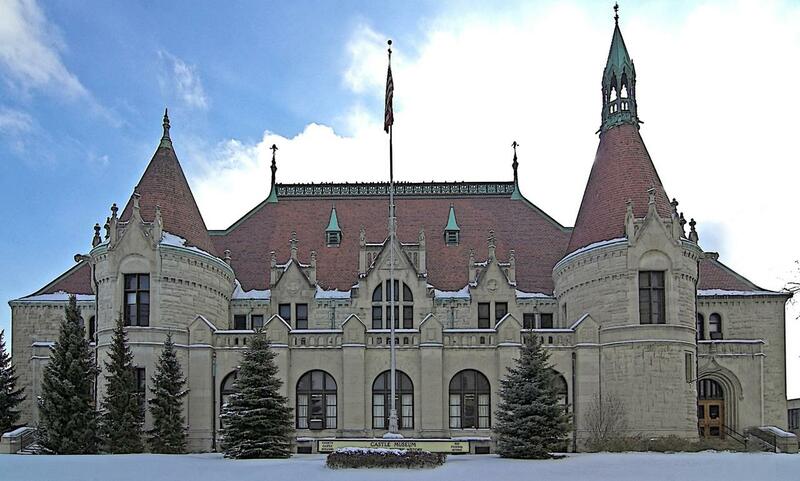 The castle was built in 1918 by the president of Sears, Roebuck and Co. Besides its stunning stone exterior and pointed tower roofs that look like they’ve come straight out of Disney movie, the castle includes a traditional courtyard, perfectly manicured gardens, and a state-of-the-art interior. Though the castle was intended to be an impressive place at which to show off the company’s latest products (especially farm equipment), it is today a venue for concerts, weddings, and other special events. A millionaire shoemaker built Castle in the Clouds for his wife in 1914. 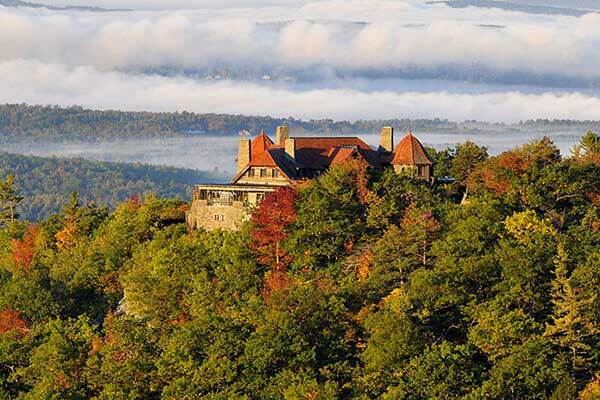 Like a fairytale come to life, the castle is perched atop a mountain where it overlooks New Hampshire’s largest lake. While its features may seem a bit odd or dated to modern-day visitors, the castle was full of state-of-the-art amenities upon its initial construction, including a circular shower and a central vacuum system. Today, the castle is owned by a conservation trust and open to the public. Harry D. Andrews, a World War I veteran and self-proclaimed medievalist, took on the task of building Chateau Laroche (named after an army hospital in France) in 1929. Andrews molded each brick using cement and quart milk cartons — pretty incredible! When Andrews died, he bequeathed his chateau to a local Boy Scout troop. While most visitors come to Chateau Laroche to catch a glimpse of Andrews’ amazing work, many come to investigate the rumor that the castle is haunted. Listed on the National Register of Historic Places, the Castle Museum — also known as Castle Station — was built in 1898 not as a fancy home, but as a testament to Saginaw, Michigan’s earliest settlers, French fur traders and trappers. Visitors will notice the castle’s exterior has been greatly inspired by the characteristic French chateau, while the interior includes a number of design and decor features inspired by the Italian Renaissance and even the European Gothic periods. Today, the castle is an interesting museum and the official home of the Historical Society of Saginaw County. 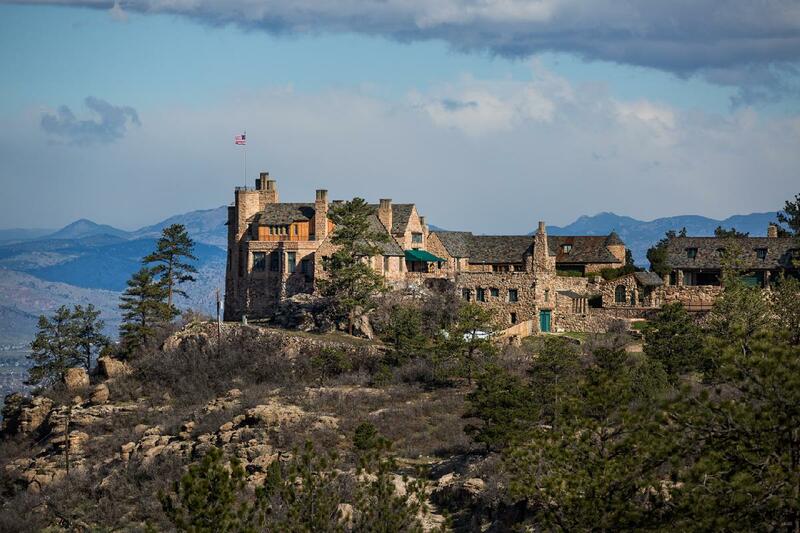 Cherokee Ranch and Castle in Sedalia, Colorado was built in the 1950s by Southern Belle-turned-rancher Tweet Kimball, who designed the castle after 15th century Scottish fortresses and had it built using only volcanic stone. Mrs. Kimball was well known for the lavish parties she threw in the castle’s giant Great Room, which opens up to a veranda that overlooks the local highlands. The castle also includes a number of art pieces and antiques that Mrs. Kimball picked up on her extensive travels — all of which can be seen by visitors on public tours. 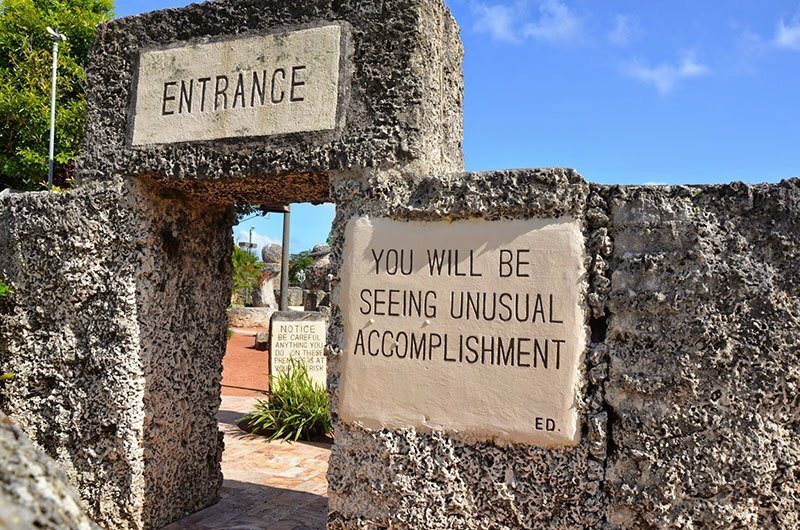 What makes Coral Castle so impressive isn’t necessarily its fortress-like architecture, but its history. When Latvian immigrant Edward Leedskalnin was left at the altar by his 16-year old bride, he took on the task of building this monument to love. Every piece of Coral Castle, which includes a two-story tower, a sculpture garden, and even a throne room, was built by Leedskalnin’s hands using stone from his own property. The castle took 28 years, and is today open to the public as a museum. Fonthill Castle, constructed between 1908 and 1912, is the former home of Henry Chapman Mercer. As an archaeologist and ceramicist, Mercer filled his mansion with hundreds of pieces from his private collection, including an especially impressive accumulation of tiles and prints. But the most impressive work of art is the castle itself. Mercer designed the place himself, and included architectural elements of Medieval, Gothic, and Byzantine styles. The whole place is comprised of 44 rooms, 18 fireplaces, and more than 200 windows. There’s a little piece of Medieval Europe in East Haddam, Connecticut. 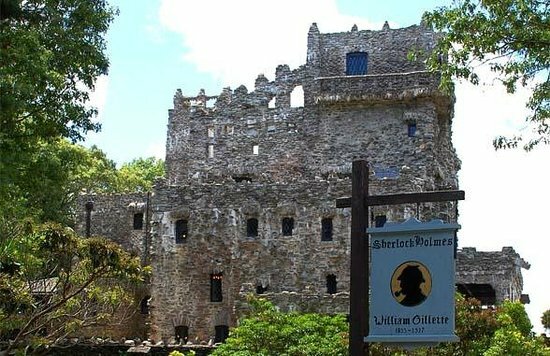 Gillette Castle was built by the actor William Gillette, who is most famous for having played Sherlock Holmes in a 1914 stage version. His castle is filled to the brim with unique (read: odd) details. Hidden mirrors served as an early 20th century surveillance system, while a collection of strange doorknobs and locks boast varied histories and even more varied functions. 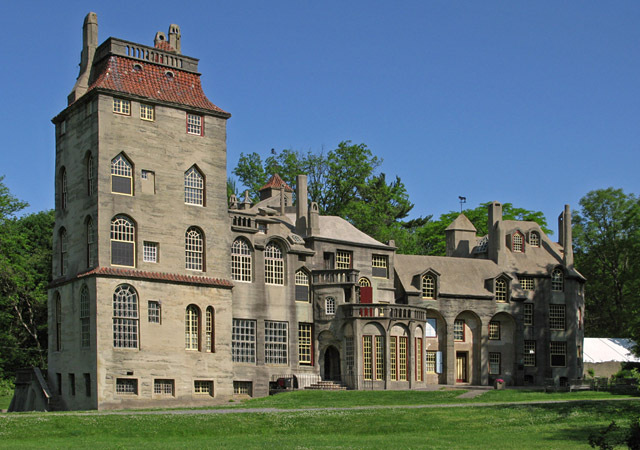 Situated on the campus of Arcadia University in Glenside, Pennsylvania is Grey Towers Castle. This incredible castle was built by William Welsh Harrison, the sugar refining magnate, and its solid grey-stone exterior is designed to look like Alnick Castle in Northumberland, England. The inside, however, boasts a decidedly French air, complete with colorful tapestries, 40 gilded ceilings, hand-carved woodwork, fireplaces that lead to secret passageways, and a Mirror Room à la Versailles. 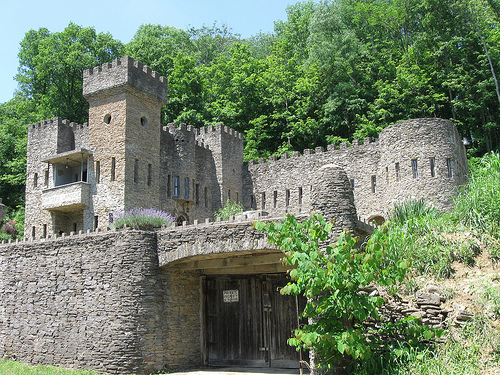 After spending his childhood living in England, the famed American inventor John Hays Hammond, Jr. built his very own castle right here in the United States. Hammond Castle was constructed during the 1920s and its design and architecture include local stone, plus features and artifacts from the Roman, medieval, and Renaissance eras that Hammond collected on his extensive travels. Visitors can tour the castle, now a museum, to see its many beautiful rooms as well as the inner courtyard, which Hammond had constructed from medieval storefronts he found in France. Crowning a California hillside and overlooking the town of San Simeon is Hearst Castle, the home of newspaper tycoon William Randolph Hearst. 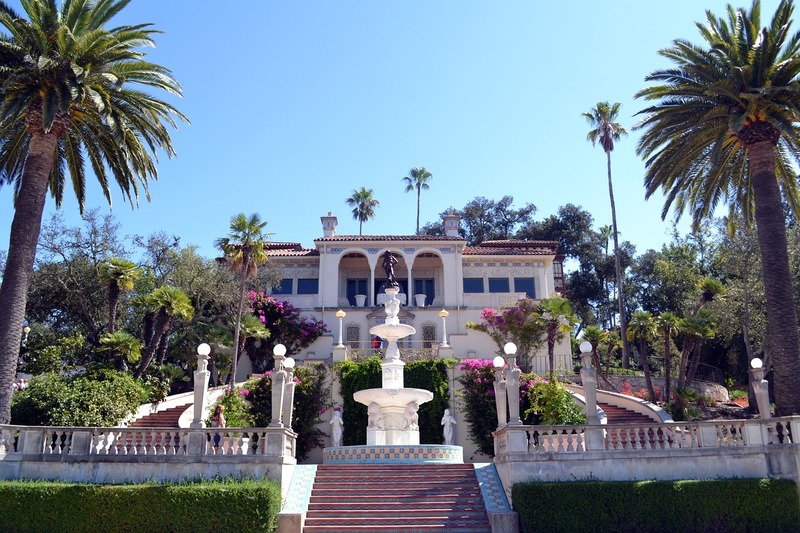 Designed by architect Julia Morgan, and built between 1919 and 1947, the castle features four separate buildings, 165 rooms, and 127 stunning acres of terraced gardens. Even the guest house has 46 rooms! Most of the castle is designed in the Gothic architectural style, and includes a plethora of unique features. Visitors touring Hearst Castle won’t want to miss the main house’s dramatic vaulted Spanish ceiling, which dates back to the 1400s. The son of railroad tycoon Jay Gould commissioned Hempstead House, which he originally wanted to be a replica of Ireland’s Kilkenny Castle. The castle was almost completed when Mr. Gould decided he didn’t like the way it looked, so an additional house was built on the property to serve as the owner’s lavish main residence. Today, Hempstead House offers visitors guided tours as well as a number of special events throughout the year, including a well-attended Halloween event. This impressive castle has also been used as a location for films like Malcolm X and Scent of a Woman. Here’s an incredible castle that was actually used as a royal palace. Built in 1882 to house the Hawaiian monarchy, the palace became a capitol building and then a museum once Hawaii became state #50. 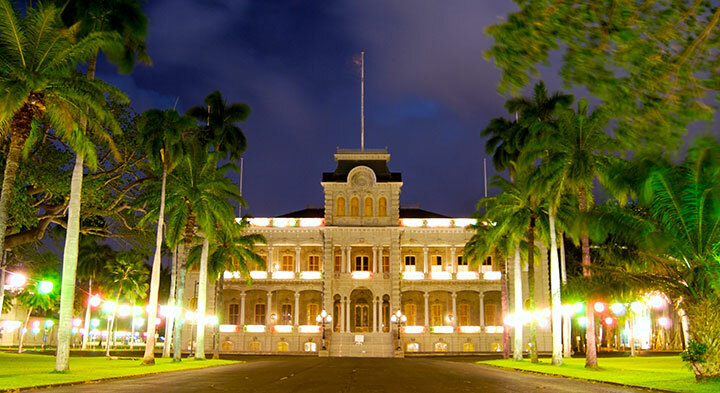 Iolani Palace has a distinctive Hawaiian look, but was actually inspired by the traditional design of European palaces. 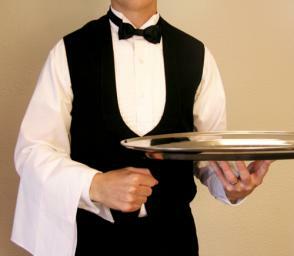 Today, it’s said to be the only example of “American Florentine” style left in the United States. 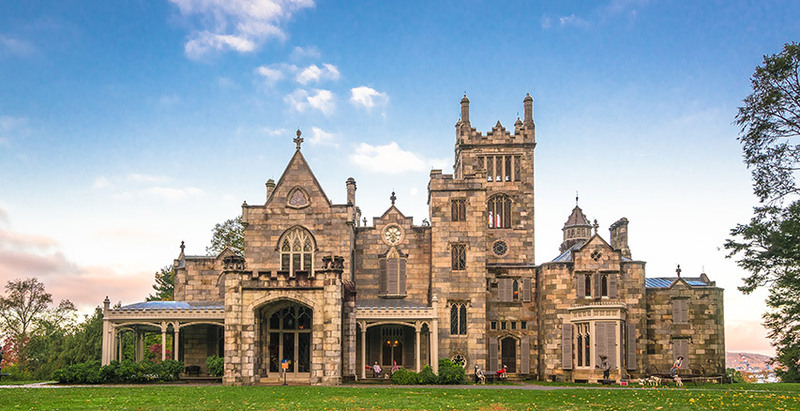 Perched along the edge of the Hudson River is the gorgeous Lyndhurst Castle. Over the years, it has been home to a number of notable figures, including New York City mayor William Paulding, Jr. and railroad tycoon Jay Gould. 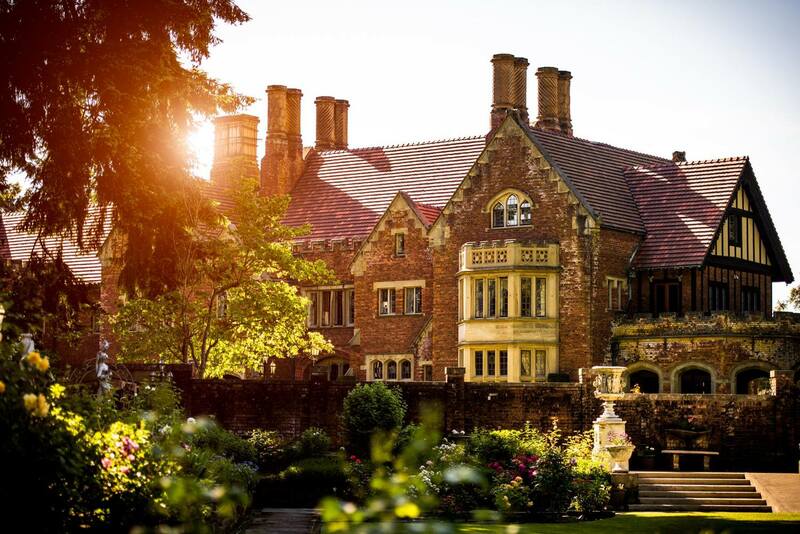 Built in 1838 by the famous architect Alexander Jackson Davis, Lyndhurst is said to be one of the very best examples of Gothic Revival architecture in the nation. Its forbidding exterior, narrow hallways, and vaulted ceilings have been sought out by both tour groups and Hollywood, the latter of which has used it as a location for many films and TV shows. 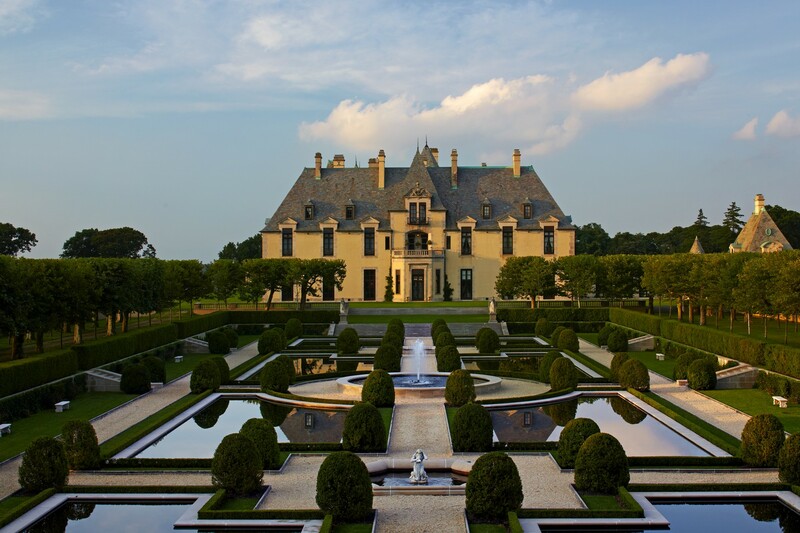 Cinderella would feel right at home OHEKA Castle, also known as the Otto Kahn Estate. 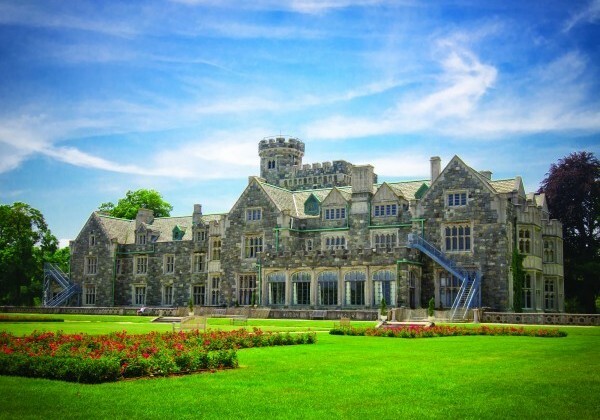 Located on the North Shore of Long Island, the castle boasts 127 rooms over 109,000 square feet. It cost more than $11 million to build in 1914 (the equivalent of $110 million in today’s value), which may not be so surprising once you learn that Mr. Otto Kahn was the inspiration for Mr. Monopoly. 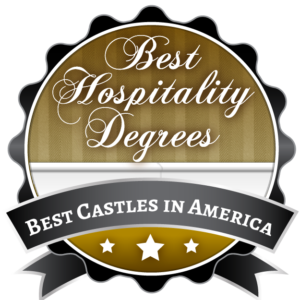 Since the days of Mr. Kahn, the castle has been beautifully restored, and is currently a luxury hotel where lovers of castles can shell out anywhere from $400 to $1,100 per night to stay. 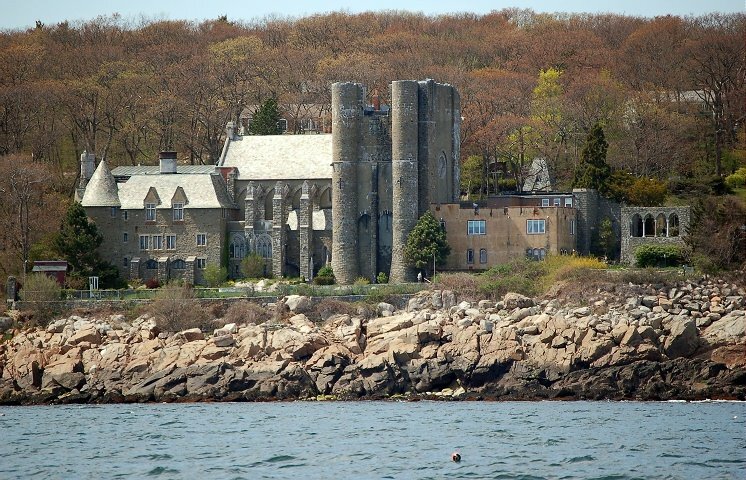 Sir Ivan’s Castle, known for its elaborate, Gatsby-style parties, has long been known as the place to be come summertime in the Hamptons. Owned and inhabited by the recording artist Sir Ivan, this incredible castle boasts such features as switch-activated fireplaces and televisions, mahogany furniture, gold accents, full suits of armor standing guard, a 20-person dining table with red-velvet chairs, tennis courts, luxury pool, gym and spa, and much more. Sir Ivan even included a full dungeon. 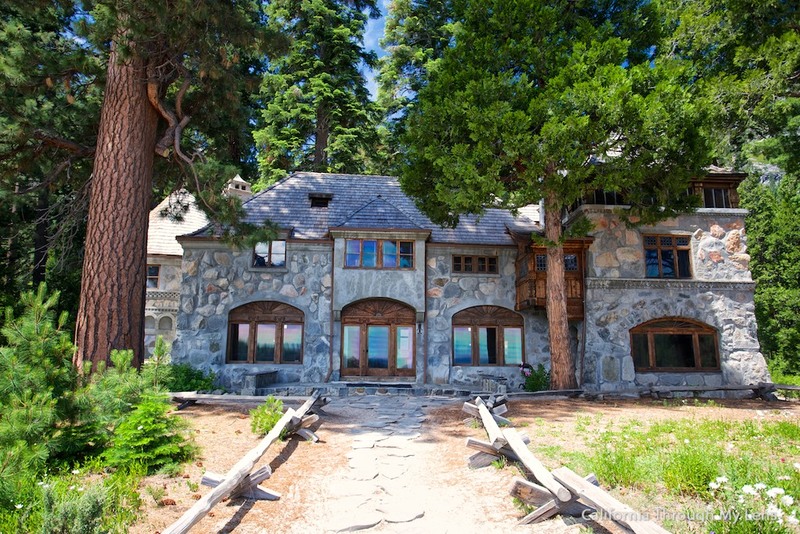 Perched near Lake Tahoe’s beautiful Emerald Bay is Vikingsholm, the 38-room, Scandinavian-inspired mansion that was once the summer home of Lora Knight, the woman who backed Charles Lindbergh’s trans-Atlantic solo flight. Despite the fact Mrs. Knight had no Scandinavian heritage, her incredible castle is full of wonderful Nordic features. Visitors who take the time to hike to the mansion will find huge hand-hewn timbers, Scandinavian carvings around the doors, carved dragon heads around the exterior roof peaks, Nordic fireplaces throughout the interior, and intricately carved dragon beams in the living room. 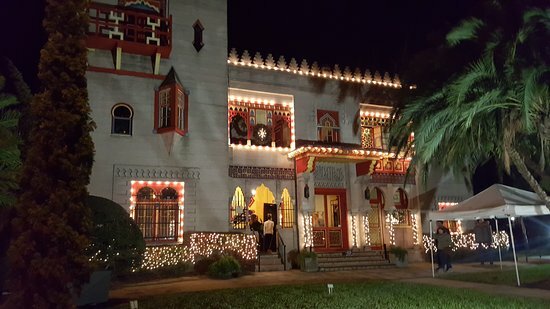 St. Augustine, Florida’s Villa Zorayda is the only castle on our list modeled after a Moorish Alcazar. Specifically, Villa Zorayda was inspired by The Alhambra in Granada, Spain, and is chock-full of stunning features such as colorful tile work, Moorish arches, quiet courtyards, lots of water features, a sultan’s divan, and even a 2,300-year old rug woven entirely of cat hair. Originally used as the winter residence for Franklin Smith, a politician and Boston-based hardware merchant, the villa also spent time as a speakeasy before being restored into a kitschy, yet impressive, museum. Winterthur is more of a country manor than a castle, but incredible it is, nonetheless! 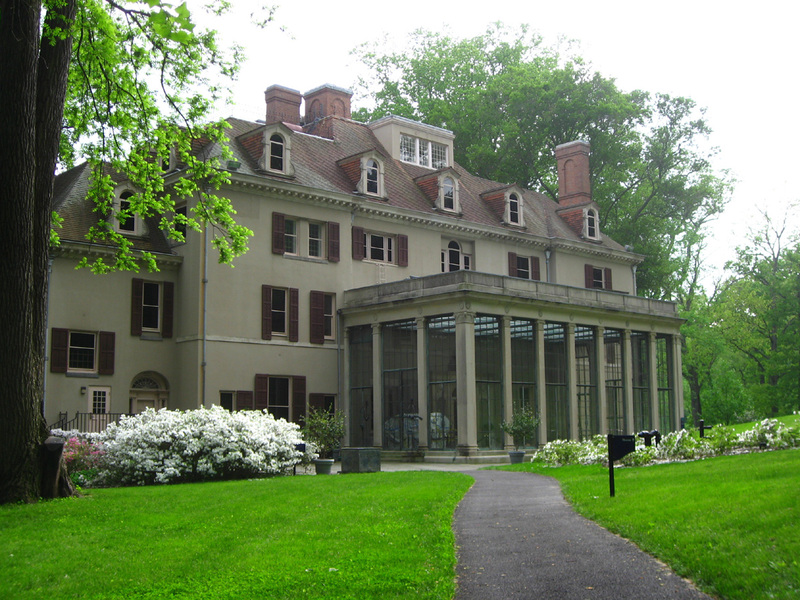 Originally, Winterthur was the home of Henry Francis Du Pont, who, upon amassing an American decorative arts collection too big for the 100 existing rooms, decided to add 75 more rooms to the building. Today, the manor is open to the public as a museum and library. Visitors won’t want to miss Winterthur’s indoor “courtyard.” Cobblestone areas surrounded by the actual facades of colonial-era houses give visitors the feeling of walking down a residential street of yesteryear.